It’s common knowledge that consumers are increasingly turning to online reviews on sites such as Yelp! and Amazon before making purchasing decisions. And with an ever-growing number of sites providing online reviews of business software products, B2B software buyers are beginning to mimic consumers’ behavior. Historically, software marketers owned the whole “story” of a software product: From white papers to references to website copy, these marketers controlled the messaging. But through online reviews, software users have become part of the narrative. And as IT becomes increasingly consumerized, that narrative is transforming into a dialogue. To further explore the power of software reviews, Software Advice, in collaboration with online sampling firm Research Now, conducted an online survey of 386 B2B software buyers. We set out to determine who consults reviews, when they consult them and why they are important for software buyers and vendors alike—and we were asked to present our research at Salesforce’s 2014 Dreamforce conference. Here’s what we found. The vast majority of buyers surveyed (75 percent) consulted online reviews before making purchasing decisions about business software. Buyers who consulted online reviews during the software-selection process were ultimately more satisfied with their purchases. Software products that received a mix of positive and negative online reviews were perceived by buyers as being more trustworthy. First, we screened respondents to ensure that the buyers we surveyed had been highly involved in choosing business software for their company within the past five years. Of these buyers, a full three-quarters consulted online reviews before making their last software purchase. 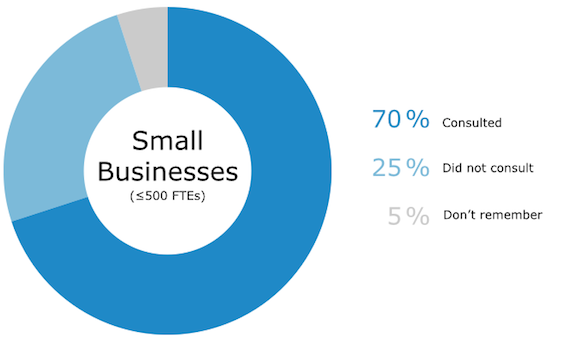 When broken down by business size, we found that a greater proportion of buyers from large businesses—those with over 500 full-time employees (FTEs)—consulted reviews before purchasing software than buyers from smaller businesses (87 percent versus 70 percent, respectively). This is surprising, as the enterprise is notorious for its slow, tortured decision-making processes and mountains of red tape. However, our results are in line with other findings that show enterprises are beginning to make better, more efficient decisions (albeit slowly)—because consulting reviews is a great way to make more informed decisions more quickly. What’s more, the likelihood of buyers to consult reviews when evaluating a software purchase is increasing over time. Buyers said they were more likely to consult reviews today (a combined 76 percent were either “extremely” or “very likely” to do so) than they were five years ago (a combined 46 percent). And five years from now, buyers anticipate being even more likely to consult reviews: A combined 80 percent said they’d be “extremely” or “very likely” to do so. Today, consumers across all markets are doing their own online research long before they go to the store or reach out to a salesperson. 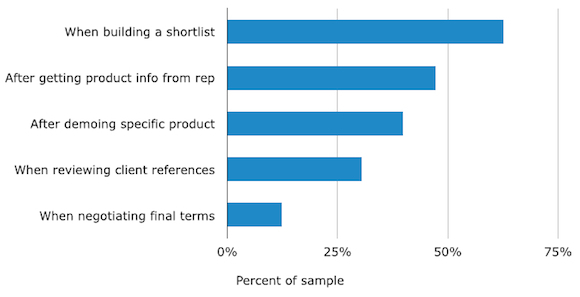 Similarly, the B2B buyers we surveyed consulted reviews early in the purchasing process: 63 percent did so when building a shortlist of software products to evaluate. 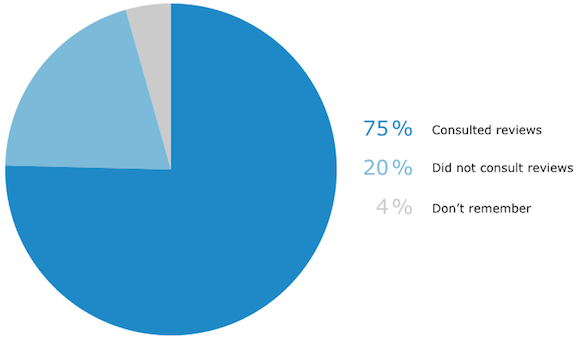 And 47 percent consulted reviews after getting product information from a sales rep (which also tends to happen earlier in the purchasing process). These findings reflect greater trends across the B2B market, as well. According to studies by DemandGen Report and the Corporate Executive Board, respectively, 77 percent of B2B buyers conducted their own research before talking to sales—and B2B buyers said they wouldn’t talk to a sales rep until they were 57 percent sure of their purchasing decision. In an age where the trusted opinions of others are freely accessible online about almost every product imaginable, it’s no surprise more buyers are turning to online review sites before getting the typical sales spiel. Not only did we want to explore when and why buyers consulted reviews, we wanted to explore when and why they wrote them, as well. As it turns out, most buyers were altruistic in their motives for writing online software reviews: 59 percent of those surveyed said they wrote reviews to help others. This makes sense, given that so many buyers rely on reviews themselves when making purchasing decisions about software; it follows that they would want to help others faced with similar choices. However, it should be noted that less selfless motivations were not far behind: Half of buyers left reviews in hopes that they would reach the vendor and impact product development, presumably regarding features they wanted the product to have, bugs they’d like to see fixed and so on. Thirty-eight percent simply wanted to express their feelings about the product, while 27 percent left reviews in exchange for incentives (such as gift cards, sweepstakes entries or monetary rewards). We also surveyed buyers on whether they were more likely to write a review after a positive or a negative experience with a given software product. 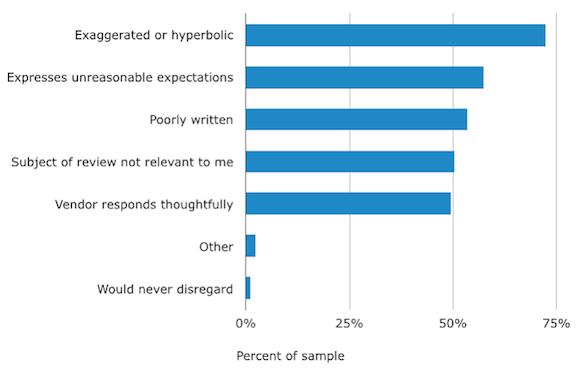 Flying in the face of the popular belief that people only remember the bad experiences, a majority of buyers surveyed (44 percent) said they were more likely to write a review after a positive experience with their software. While this data may seem surprising, it is, in fact, consistent with the reviews we see on Software Advice’s website, where the positives outnumber the negatives. It’s even in line with consumer reviews: As of Q3 2013, a striking 66 percent of all Yelp reviews were four stars or higher. And, perhaps even more surprising—given that bad medical experiences are quite likely to be memorable—a Journal of Internal Medicine study found that 88 percent of physician reviews across 33 online medical-ratings sites were positive. This suggests that not only are buyers consulting online reviews when researching software, they’re actually using them to make purchasing decisions. Indeed, according to a report by Zendesk, 88 percent of consumers surveyed were influenced by online customer service reviews when buying. And our research supports this notion: A combined 59 percent of buyers were either “extremely” or “very likely” to choose one product over another based on that product having more favorable online reviews. 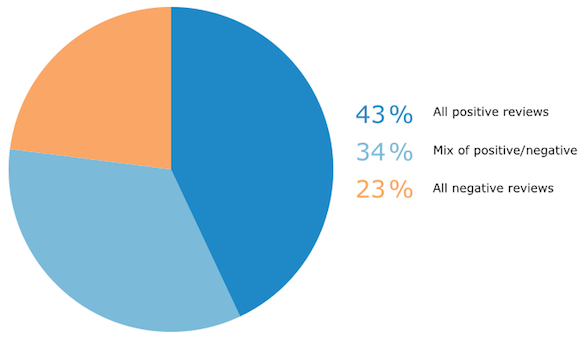 A mere 3 percent were “not at all likely” to make a decision based on positive reviews. What’s more, buyers who consulted reviews reported more satisfaction with the software they ultimately bought: 78 percent of buyers who consulted reviews were either “extremely” or “very satisfied” with their purchase, compared to 68 percent of those who didn’t consult reviews. This is also supported by Zendesk’s findings, in which 90 percent of consumers who read online reviews said positive reviews impacted their purchasing decision, with 86 percent being impacted by negative reviews. If people are being told by sources they trust which products are useful and which to avoid, it follows that they would ultimately be more satisfied with the product they choose. Thus, this data proves that having online reviews—and positive ones, at that—is crucial to the sales success of a business software product. 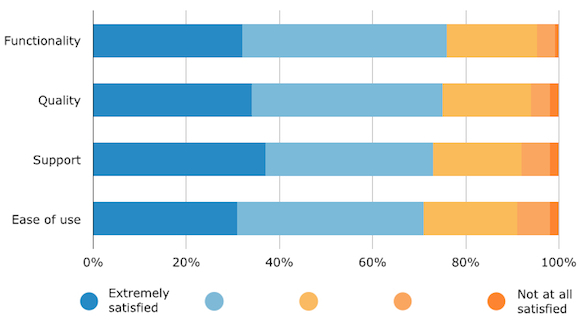 Next, we asked respondents what they were looking for when they consulted online software reviews, giving them four categories of information to choose from (the same categories we ask for ratings for on our own site): functionality, quality, support and ease of use. 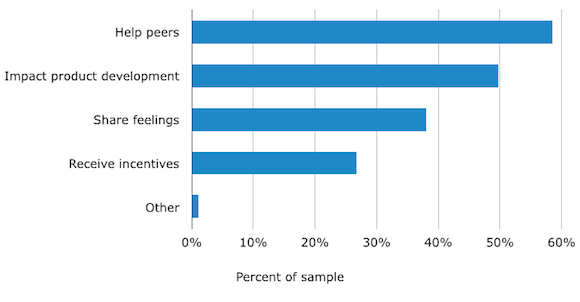 Buyers said information about a software product’s functionality was the most important part of an online review, but not by much: 76 percent said this was either “extremely” or “very valuable.” Information about the product’s quality was right behind in importance to buyers, being rated “extremely” or “very valuable” by a combined 75 percent. Feedback about the quality and availability of support for the product was rated “extremely” or “very valuable” by a combined 73 percent, and a combined 71 percent said the same about information on the product’s ease of use. However, slightly more respondents said that feedback about support and ease of use was “minimally” or “not at all valuable” than said the same about functionality and quality: a combined 8 and 9 percent versus a combined 6 percent each, respectively. These findings are not surprising: While all of these are important categories for buyers to be informed about, knowing that the product does what it claims to do and is well-built and reliable is paramount when choosing a business software solution. 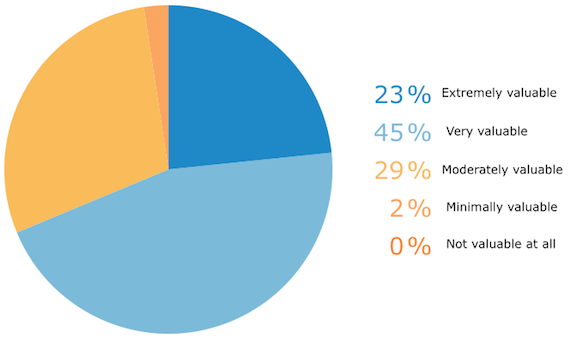 In addition to the content of reviews, we asked buyers how important the recency of reviews was. In order for online reviews to be considered as part of their software-purchasing decision, virtually all buyers surveyed said reviews had to be written within the past 12 months: Less than 1 percent said they would consider those that were over a year old. Interestingly, 71 percent said their time frame was even shorter: They would only consider reviews written within the past 6 months. 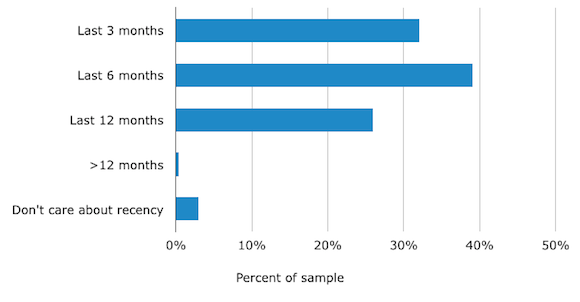 The high value placed on recency may be due to the fact that software can change rapidly—for example, in agile software development, release cycles are typically shorter than one year, and are often as brief as three to six months. And an online review of a past version of a given product is essentially useless to consumers: That feature the reviewer likes may have been changed since then; the bug everyone was complaining about may have been fixed. Clearly, timing is key. Thus, vendors and other companies that collect online reviews must ensure that they are capturing them on an ongoing basis. But how can they do this (in an ethical manner)? We’ve experienced success with this technique here at Software Advice. In one instance, we ran a campaign with a construction software vendor in which everyone who submitted a review for a specific product was entered in a drawing to win an iPad. The result? We got 161 new reviews for that product—90 percent of which were 3.5 stars or higher. We’ve established that buyers are very likely to purchase a product based on reading positive reviews. However, we also know that the power of negative persuasion can be quite strong. So, we asked buyers which would have greater impact on their purchasing decision: positive reviews (which would steer them towards a given software product) or negative ones (which would steer them away from a given product). 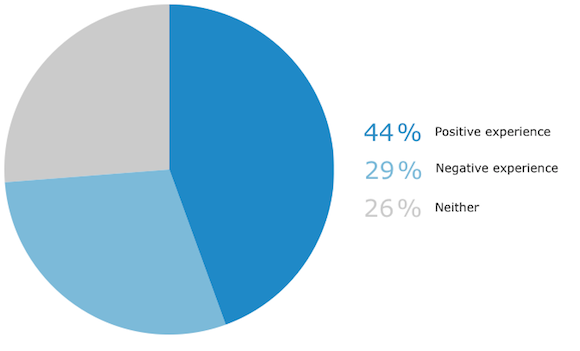 Positivity won out once again, as 43 percent of respondents said that positive reviews would have a stronger impact on them than negative ones (described as more impactful by only 23 percent). This falls in line with our previous data: since buyers are more likely to leave positive reviews, it’s only logical that they would give more weight to the positive reviews they read, as well. The vast majority (a weighted 77 percent) said that a mix of positive and negative would make a given software product’s online reviews seem more authentic. 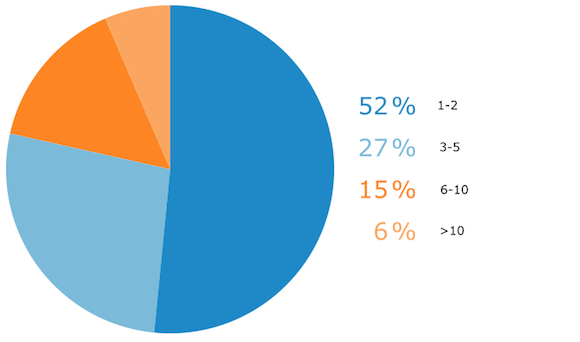 Interestingly, the buyers we surveyed would consider a product with all positive reviews (53 percent) essentially equivalent to a product with no reviews at all (51 percent), from an authenticity standpoint. And a product with all negative reviews wasn’t far behind, at 55 percent. 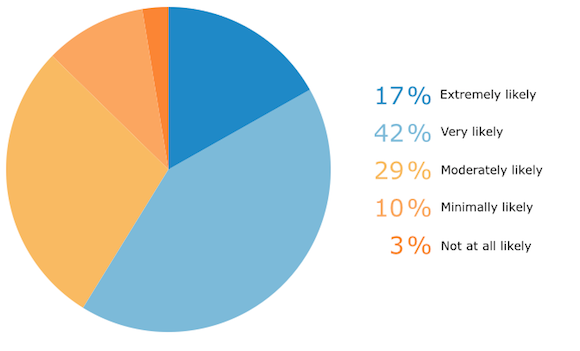 Similarly, we asked buyers what balance of reviews would make a given software vendor seem most trustworthy. (Here, too, we assigned a weighted “trustworthiness” score to each balance of reviews.) Once again, a mix of positive and negative online reviews would inspire the most trust in buyers—chosen by a weighted 76 percent. So, as it turns out, buyers don’t want to see all positive reviews when evaluating a software product. In fact, product reviews with extreme ratings—either positive or negative—may actually be perceived as less helpful by consumers. At first, this may seem counterintuitive—but it makes sense when broken down. Buyers know that there are pros and cons to everything, but when they talk to sales reps or read vendor-produced marketing materials, they only hear the pros. So while buyers know there are inherently some cons to the product, they don’t know what those cons are. This represents risk; since buyers are naturally risk-averse, this can, at worst, drive them away, or at best, instill doubt in their potential purchase. Thus, it follows that buyers may actually feel more confident when they know what the cons for a given product are—which a healthy balance of positive and negative reviews represents. This is borne out by additional data from social commerce firm Reevoo, which not only found that a majority of consumers trusted reviews more when they were a mix of positive and negative, but found that the presence of negative reviews actually boosted conversions by 67 percent. 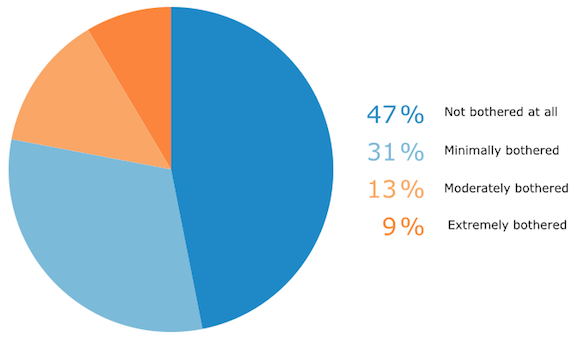 Understandably, however, a cluster of negative reviews about the same topic was found to be much more worrisome: While only 13 percent of buyers said a single negative review was “extremely” or “very likely” to deter them from a software purchase, nearly half of buyers (44 percent) said a cluster of negative reviews would steer them away. While a single negative review is likely to be seen by consumers as simply one person’s bad experience, clusters of reviews about a specific issue are likely to represent bugs, functional difficulties or user-unfriendly aspects of the software. But while some software vendors may see the presence of such negative reviews as cause for concern, others are taking the opportunity to learn from them and use them to improve their products—which can ultimately lead to selling more of them. What’s more, 57 percent would discredit reviews that expressed unreasonable expectations on the part of the reviewer—and over half (53 percent) would discount reviews simply because they were poorly written. It’s also interesting to note that half of buyers surveyed would discount a negative review if the software vendor responded to it thoughtfully; this represents an opportunity for vendors to recapture what might otherwise have been lost business. 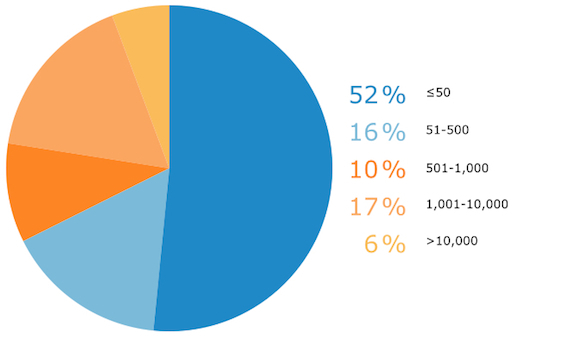 Looking at the demographic breakdown of the buyers who took our survey, the majority came from smaller businesses with 50 or fewer employees. This finding is roughly in line with the actual breakdown of businesses using software in the U.S. 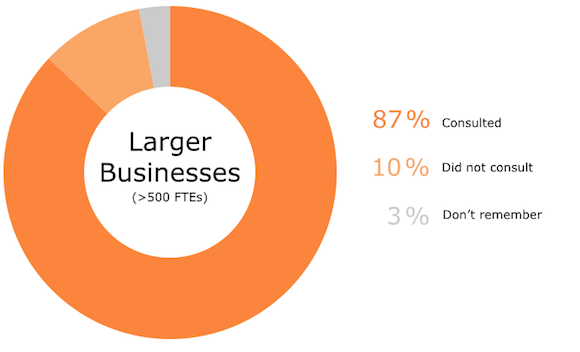 Most of our respondents also represented major company decision-makers: A combined 64 percent were either an owner, president or sole proprietor; a C-level executive, such as a CEO; or a director (30 percent, 18 percent and 16 percent, respectively). 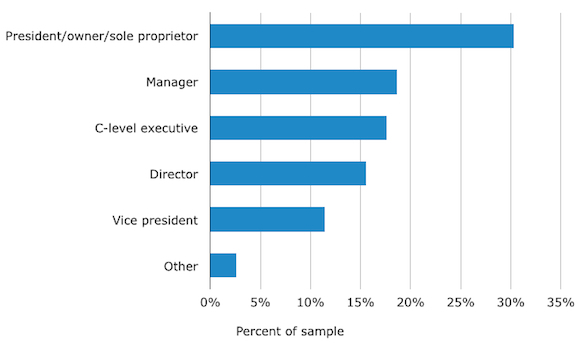 An additional 19 percent were managers, and 11 percent were vice presidents (or senior or executive vice presidents). Finally, the vast majority of buyers—a combined 78 percent—were from companies with five or fewer of major decision-makers, and 52 percent had just one or two leaders responsible for making important business decisions. These findings make sense, as at many smaller businesses, a few company leaders are responsible for making every significant decision—all the way down to what software is used around the office. When companies get larger, and especially when they reach enterprise-level, dedicated IT teams are typically in charge of making decisions about business software purchases. So, to sum it all up: 75 percent of buyers surveyed consulted reviews before purchasing software within the past five years, and that number will only grow in the five years to come. Larger businesses were more inclined to consult reviews than smaller ones, and buyers checked online reviews early in the purchasing process. Buyers were more likely to leave reviews after a positive experience with a software product than after a negative one. Those who consulted reviews were ultimately more satisfied with their software purchase, as buyers not only considered reviews highly valuable, but were more likely to choose a product based on it having positive reviews. Finally, buyers wanted to see recent reviews, and they wouldn’t trust a product or vendor that had all positive or all negative reviews, as opposed to a balance of each. However, they say they don’t put too much stock in any one negative review, and are able to overlook those that are exaggerated, skewed or poorly written. It’s clear that online software reviews are not only essential to buyers making smart, satisfied purchasing decisions—but also to vendors who want to connect with buyers, improve their products and, ultimately, move more units. The future of business software selection is clear: It lies in the power of the crowd. In collaboration with Research Now, Software Advice conducted a survey of 386 B2B software buyers. Respondents were screened to ensure that they had been highly involved in the evaluation, final selection and purchase of a business software product for their company within the last five years. Research was selected for presentation at Salesforce’s 2014 Dreamforce conference. If you have comments or would like to obtain access to any of the charts above, please contact hollyregan@softwareadvice.com.